Terminator Dual 12 inch 400W RMS 2 Ohm Sealed Loaded Enclosure. Incredible bass at an unbeatable price. Two twelve inch Terminator subs at 400 watts is going to get loud. You can't beat it.. Unbeatable Bass and Unmatched Performance. The MTX TNE212D combines great subwoofer design with perfect enclosure design to deliver bass that far exceeds expectations. The unit is a dual 12 sealed enclosure that has a single terminal cup showing a final 2 load to any connected amplifier. The Terminator subwoofers used in the enclosure include polypropylene dustcaps that are durable allowing them to survive the rigors of most trunks and are lightweight allowing them to efficiently move using less power. Each subwoofer can handle 200 watts RMS power, resulting in a power level of 400 watts RMS/800 watts Peak for the entire enclosure. The subwoofers also incorporate Spider Plateau Venting, which is a mechanical cooling process that allows the subwoofer to continually refresh the air around the voice coil helping to dissipate the heat generated during extended play. The enclosure itself is made using extra-strength 5/8 MDF (medium density fiberboard) which is the preferred material for subwoofer enclosures. Where other manufacturers only use a 1/2" board, the MTX 5/8" board is stronger ensuring that the enclosure can contain the massive low frequency sound waves generated by the subwoofers without problems. Ncredible bass at an unbeatable price. In a dual, sealed enclosure. WILL IT FIT IN MY CAR? Height 14", Width 29.63", Bottom Depth 13.5", Top Depth 11.13". WHAT KIND OF AMP DO I NEED? You need an amp that is capable of sustaining a 2 Ohm mono load. MTX recommends using the THUNDER 500.1 (See Below) to power the TNE212D enclosure for an awesome bass experience. 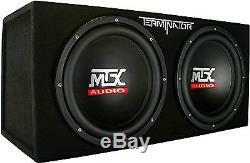 2 - 12 MTX Terminator Subs. 1200W Max Power, 800W Peak Power, 400W RMS. Classic Look and Contemporary Style. The enclosure is wrapped in black aircraft grade carpet. The classic black goes well with any interior and the high quality ensures it will be resilient to tearing and wear. The embroidered Terminator logo and large MTX Audio logos on the dustcaps ensure that everyone will know what brand you choose to ride with when you open your trunk. Just remember not to tell them how much you paid if your system is louder than theirs. No better deal exists in the world of car audio today. Pair this enclosure with a THUNDER500.1 mono block amplifier and you will be amazed at the bass it puts out. Here's a GREAT Amp for Your Box! The item "MTX Terminator TNE212D Dual 12 inch 400W RMS 2 Ohm Sealed Loaded Sub Enclosure" is in sale since Tuesday, October 27, 2015. This item is in the category "Consumer Electronics\Vehicle Electronics & GPS\Car Audio\Car Subwoofers". The seller is "main-street-pro" and is located in Winslow, Illinois. This item can be shipped to United States, Canada, Denmark, Romania, Slovakia, Bulgaria, Czech republic, Finland, Hungary, Latvia, Lithuania, Malta, Estonia, Australia, Greece, Portugal, Cyprus, Slovenia, Japan, Sweden, South Korea, Indonesia, Taiwan, South africa, Thailand, Belgium, France, Hong Kong, Ireland, Netherlands, Poland, Spain, Italy, Germany, Austria, Israel, Mexico, New Zealand, Philippines, Singapore, Switzerland, Norway, Saudi arabia, Ukraine, United arab emirates, Qatar, Kuwait, Bahrain, Croatia, Malaysia, Brazil, Chile, Colombia, Costa rica, Dominican republic, Panama, Trinidad and tobago, Guatemala, El salvador, Honduras, Jamaica.